Board Proclamations – Peninsula Moves! WHEREAS, the average SamTrans rider saves $35 a month or $420 a year by taking SamTrans instead of driving. 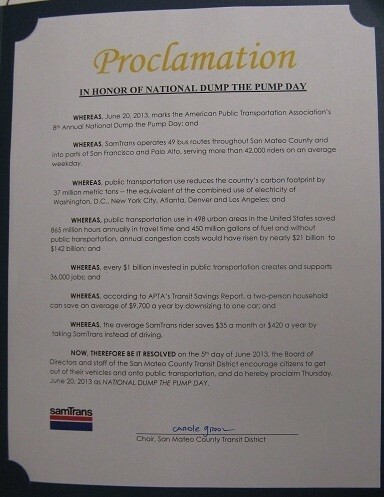 NOW, THEREFORE BE IT RESOLVED that the Board of Directors and staff of the San Mateo County Transit District encourage citizens to get out of their vehicles and onto public transportation, and do hereby proclaim Thursday, June 20, 2013 as NATIONAL DUMP THE PUMP DAY. WHEREAS, the average Caltrain rider saves $340 a month or $4,080 a year by taking Caltrain instead of driving. 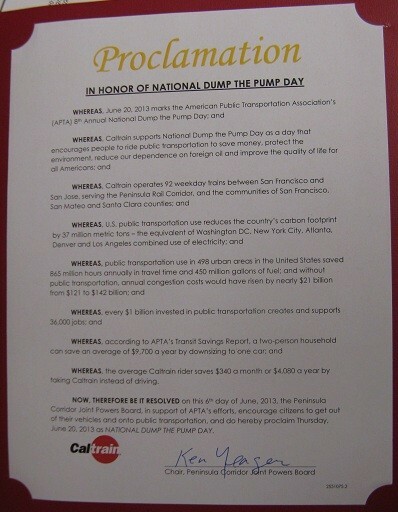 NOW, THEREFORE BE IT RESOLVED that the Peninsula Corridor Joint Powers Board, in support of APTA’s efforts, encourage citizens to get out of their vehicles and onto public transportation, and do hereby proclaim Thursday, June 20, 2013 as NATIONAL DUMP THE PUMP DAY.